What are the benefits of our consultancy and training for ISO/IEC 17025 accreditation? Provides additional information about the quality of each measurement made during the calibration process. Helps to implement the method of measurement uncertainty. Helps to establish technical competency of the laboratory and reliability of results. Eliminates the need for supplier auditing - calibration suppliers are independently verified through the accreditation process. Enables easy comparison of suppliers from different countries. Improved level of motivation, cooperation, workmanship and quality awareness. Provides guidelines for better control for maintenance of instruments, environment control, preservation of test records, etc. We offer Laboratory Accreditation Auditor Training Presentation Kit, which is prepared by a team of highly-qualified management professionals and internal auditors. This lab accreditation training presentation kit is very useful while conducting corporate training on laboratory management system as per requirements of both calibration as well as testing laboratories or any work area. Our many clients in USA, UK, UAE, Bahrain, Qatar and Middle East have already used it while preparation of ISO: 17025:2017 certification training to their employees. This training material is pleasingly designed and presented to clearly communicate the message and establish a much better understanding. We have guided more than 100 laboratories and refineries globally, which got accredited to ISO 17025:2017 and successfully implemented Quality system in their calibration and testing laboratories. What Does ISO 17025:2017 Auditor Training Presentation Kit Offer? 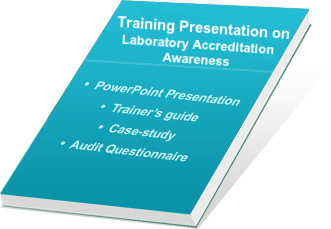 Lab Accreditation Auditor Training Presentation Kit contains more than 330 ppt slides and handouts as literature for participant’s further learning. This component comprises more than 330 slides on laboratory accreditation, each pleasingly presented to get the message, and establish a much better understanding. The soft copy of presentation and hand-outs are given and one can edit them as per their own requirements. Handouts are written in MS Word 2007 and Presentation is made in Powerpoint. Developed under the guidance of experienced experts and globally proven consultants having experience of more than 25 years in certification consultancy. User-friendly and easy-to-learn; one can add company logo as well as voiceover for the training of staff. Completely editable presentation, hence, time-saving and cost-saving training material. Our products are highly sold globally and used by many laboratories during implementation of ISO 17025 system. Our training presentation kit provides total customer satisfaction as well as value for money. More than 1000 hours are spent in preparation of this training presentation kit. View free Demo of ISO/IEC 17025:2017 auditor training presentation kit and purchase it with secure online transaction.